… and Shujaa AlQahtani, of Saudi Arabia, a manufacturing engineering technology demonstrating the Genos M560 vertical machining center. The second of two episodes of “PMA Perspective” featuring Penn College aired Sunday morning on the Pennsylvania Cable Network. David N. Taylor, president and CEO of the Pennsylvania Manufacturers’ Association, and the “PMA Perspective” crew toured and filmed in the plastics and polymer engineering technology labs, led by Kirk M. Cantor, professor of plastics technology; in automated manufacturing/machining, guided by Richard K. Hendricks, instructor of machine tool technology/automated manufacturing; and in rapid prototyping (3D printing), led by Eric K. Albert, associate professor of machine tool technology/automated manufacturing. Last week’s first episode featured an interview with Penn College President Davie Jane Gilmour and a tour of the mechatronics lab. For that segment, Taylor interviewed Howard W. Troup, instructor of automated manufacturing/machine tool technology, and Christopher P. Ray, executive director, business development. Both installments can be viewed on the “PMA Perspective” website. PlastiVan educator Elizabeth Egan demonstrates a particular polymer’s ability to absorb oil. Joshua J. Rice, instructor of plastics technology, answers questions from Montoursville Area High School students about a speaker part molded on the college’s thermoformer. Jose M. Perez, instructor of plastics technology, talks with visitors about the thermoforming lab and the hands-on learning that students do there. Five area school districts who have students taking Penn College courses through the Penn College NOW dual enrollment program brought students to campus to gain a lesson in polymer chemistry from the Society of Plastics Engineers’ PlastiVan. They also toured the college’s plastics and polymer facilities. Feb. 19 brought a visit from the Jersey Shore High School and Sullivan County Middle School – which also attended a special session exploring personality types – and on Feb. 22, students from Montoursville Area High School, Central Mountain High School and Troy Middle School visited. The PlastiVan’s visit was sponsored by Sekisui SPI. 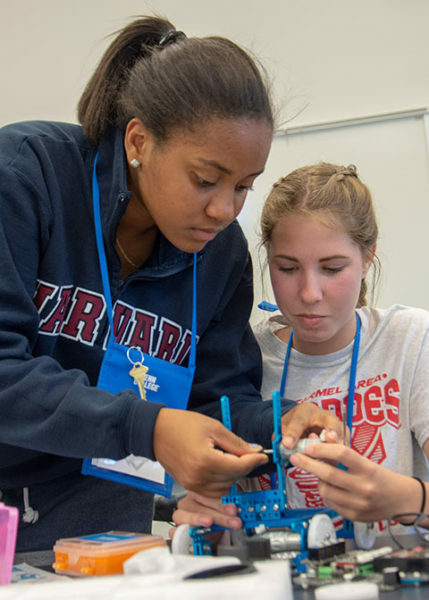 To celebrate National STEM Day, Pennsylvania College of Technology welcomed nearly 100 high school students to campus on Nov. 8. “STEM” is short for science, technology, engineering and mathematics. Two Oklahoma-based employees of Chevron Phillips Chemical Company LP – Jon D. Ratzlaff, technical services manager, and Tom Giovannetti, technical service engineer – recently visited main campus, sharing on-the-job pointers with Penn College plastics students. Networking with industry leaders and participating in a remote-controlled car contest highlighted the activities of a trio of Pennsylvania College of Technology plastics students at the 26th Annual SPE Thermoforming Conference in Fort Worth, Texas. Conducted by the Thermoforming Division of the Society of Plastics Engineers, the conference attracted over 70 exhibitors and offered several technical workshops. Thermoforming refers to the practice of heating a thermoplastic sheet until pliable and – by use of a vacuum – forming the sheet into a three-dimensional shape. Pennsylvania College of Technology alumnus Keith L. Jeffcoat recently returned to his roots to share advice and industry experience with the next generation of students. Supporting efforts to give thousands of girls the opportunity to explore science, technology, engineering and math, Pennsylvania College of Technology has partnered with Girl Scouts in the Heart of Pennsylvania and its Girls Go STEM initiative by sponsoring the organization’s new Lewisburg-based STEM Mobile. The STEM Mobile, adorned with Penn College’s logo, will be utilized by GSHPA staff traveling to community events throughout central Pennsylvania to promote STEM education for girls and young women through hands-on and collaborative activities.